Cambiamo Messina dal Basso (CMdB) is a civic-political movement, consisting of ordinary citizens, associations, left-wing parties and movements based around the ideas of participation and the Commons. CMdB emerged in 2013, building upon previous movements' experiences in Sicily, with the aim of running for local elections. Unexpectedly, CMdB won the elections in June 2013, becoming the first civic-political movement to run a major city in Italy. In September 2015, some representatives from the movement came to the Transeuropa festival in Belgrade to hold a workshop on their experiences running a city while staying true to their social movement ethos. One of their members, Federico Alagna, spoke to us. Alex Sakalis: How was the festival for you? Federico Alagna: Participating in the Transeuropa Festival was a wonderful experience! It gave us the opportunity to share our story of active citizenship and participation with people coming from very different backgrounds. Also, we felt could return home with a lot of new ideas and suggestions, with the feeling of being part of a wide network of people who try to create and share alternatives to the mainstream. AS: What did you discuss? 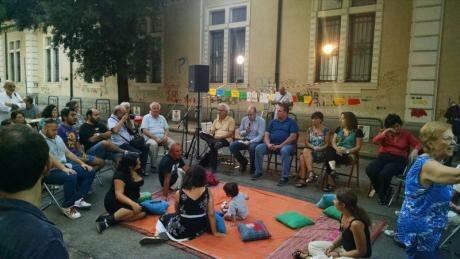 FA: We ran two workshops on the experience of our civic-political movement in Messina. We went through our story: how all this kicked off two and a half years ago, how we managed to win local elections, how we are trying to run the city, how difficult it is and how big the challenges that we face are, both inside and outside the movement. Building upon this, we engaged in great discussions with other participants, who told us their feelings and opinions, enquiring about specific aspects, offering suggestions as well as criticisms. This enriched us a lot. A CMdB agora on the streets of Messina. Photo used with permission of author. AS: Why are such festivals important? FA: These festivals give you an external frame of reference with which to examine yourself. I feel this is necessary in order to better understand what you’re doing and to improve it. Also, they basically tell you that you are not alone. I know it might sound kind of naive, but the thing is: these festivals let you know about other people who are doing in their countries what you are doing in yours. In essence they are also trying to change their communities for the better. And you wouldn’t know about each other without these kinds of festivals. Networking is a huge aspect. AS: So this is what you will take away from your time in Belgrade? FA: Exactly. New contacts, new friends, new opportunities. We’ve got so many new ideas and projects to share with our fellow activists. Just to give you an example, a few days ago a guy from Rome that we met in Belgrade – an architect with a lot of experience in promoting social cohesion and inclusive projects – came to visit us: he wanted to see what we were doing and try to set up a project with us in some neighbourhoods, involving local communities, artists and housing activists. This is simply great. AS: Tell us more about the general situation in Messina. What kind of city is it? FA: Well, Messina is not an ‘easy city’. It’s the fifth city of southern Italy: a complex reality facing, as with all the other main cities in this part of the country, a progressive decline over the last decades, on different levels - economic, social, political: a high unemployment rate - especially among the youth - massive emigration towards northern Italy or abroad, a very low level of civic engagement and political participation, and the ubiquitous presence of criminal organisations. This is why at a certain point we understood that the only way to really change this city was through a genuine bottom-up process. AS: And ‘Let’s change Messina from the bottom-up’ is indeed the English translation of ‘Cambiamo Messina dal Basso’, right? FA: Yes, exactly. CMdB is a spontaneous civic-political movement which arose two and half years ago with the aim to run for local elections and...win! Building upon previous movements’ experiences, it gathered a number of citizens, cultural and social associations, nonviolent, anti-mafia, environmentalist movements and left-wing parties through a mechanism of individual participation (that is, one participates as an individual and not as representative of this or that organisation): a mechanism which has proven to work and to stimulate cohesion. So we ran for elections and won. What we are trying to do now is to put into practice our political platform, based on the Commons and on the promotion of political participation. It’s not just what we do that matters, but also how. Top-down vs. bottom-up, I’d say. This is perhaps the most difficult part, but also the most important. We try to promote citizens’ participation through several actions, such as the ‘popular assemblies’ we organise in the neighbourhoods. And we also created a new institution: the ‘Messina Laboratory for the Commons and the Participatory Institutions’, a citizens’ forum with the task of drafting regulations on the Commons and to promote civic participation tools. 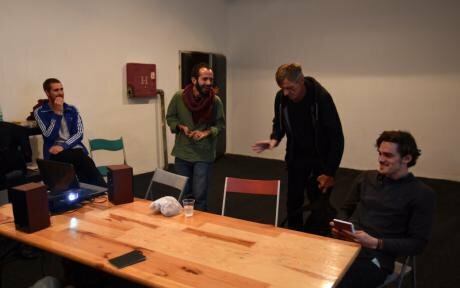 Federico (green shirt) during the workshop at the Transeuropa festival in Belgrade. Photo used with permission of author. AS: And could you put into practice some of your ideas in these two years of administration? FA: Yes, this is a crucial point actually. Because in most cases, movements like ours are accused of lacking in practice. But I really think this is not our case. In two years we could realise many concrete and strategic actions in a number of areas. Just to mention a few: we revamped public transport, which basically didn’t exist anymore in 2013, and many parties were calling for its privatisation (imagine: we had 10 buses for a 60-km long city!). In spite of budget constraints, we could revamp it, keeping it public. In other fields, we stopped abusive urban speculation, promoting territorial safeguards; waste sorting passed from 4% to 12% (which is still nothing compared to European standards...but here is a revolution!) and we introduced kerbside collection into some neighbourhoods (with sorting rates around 75%). I could speak for hours. But let me just mention a few more things that I find particularly significant. We reopened the main city theatre (which was shut down over lack of funds! ), started the process of ‘stabilisation’ of the municipality’s temporary workers, opened a house for homeless people. But we never lost our movement characteristics. And so we alternate administrative acts with movement actions, such as ‘guerrilla gardening’ or ‘guerrilla cleaning’, demonstrations, etc. AS: What challenges have you faced as an organisation, both internally and externally? FA: I think that the most serious challenges have been the internal ones. Because the external challenges were quite well-known (you know, all the ‘big powers’ resistant to change...). The internal ones have been kind of unexpected and, in a way, quite sad. For instance, those who left the movement because they thought it would be more ‘revolutionary’ and couldn’t understand the difficulty of administrating a city at the outskirts of Europe, in the middle of a financial crisis, with all the constraints coming from Rome and Brussels. Or perhaps the gap that came out between the Administration itself and the movement (even though we work closely together, we feel that there exists an ‘us’ and a ‘them’) and the difficulty in ensuring real and effective participation for some strategic decisions – due to the frequent “emergency decisions” or the lack of a properly organised participation. But I think that one of our tasks as a movement lies exactly here: as a participation facilitator, bringing up to our Administration the needs and the wills of citizens, through a stable relationship with them. AS: Can some of the lessons and successes be exported around the world? FA: During the workshop in Belgrade I was asked if I’m fully satisfied with our experience. And my answer was simply...no. The thing is, I know there is much room for improvement. But kind of paradoxically, perhaps this is one of the main lessons we learned. That things in the real world are much more difficult than one would imagine. And you can’t change institutions and the way they are connected with citizens in one day (or two years). It takes time. And there are lots of problems, challenges, disappointments. But still, you need to look at your experience with some distance, putting it in the framework of the world we live in and comparing it with what you had before and what you see around you. And then you’ll probably realise that it’s still worth the effort. I look around me, at how difficult it is to promote change at local level, especially in such difficult places as southern Italy, and I realise that what we are doing is important - revolutionary in a way - even though is not the perfect system of participation we would imagine. As far as I know, we are still a unique case in Italy (at least at a major cities level), while similar experiences seem to come out in important cities abroad, like Madrid or Barcelona (speaking of which, we probably should consider the creation of a forum of ‘municipalist’ movements, to exchange experiences, challenges and best practices). But for now I don’t have any specific lessons that can really be exported: each city, each community is different, and what is good here, maybe isn’t good there and vice versa. Strange as it may seem, the only real lesson that I really feel I can share is a methodological one: don’t throw the baby out with the bathwater! Always try to make your movement/administration experience better and to make it adhere to what you had planned. But when big problems, challenging the whole experience, arise (and they will! ), breathe, take a moment, and try to figure out how to carry on, without sacrificing either the whole experience or the true spirit and the values that characterised the entire effort. See here for more information on the festival, and click here for more of openDemocracy's coverage of the event.